Larson Home Services installs radiant barriers in attics and are experts in saving energy through your attic, as well as many other parts of your home. For your free radiant barrier estimate, call or e-mail us today! We serve Sun Prairie, Middleton, Janesville and surrounding Wisconsin areas. 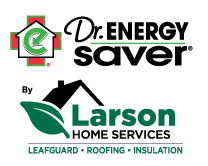 As the local experts for home insulation, Larson Home Services offers professional radiant barrier installation and specializes in a variety of insulation solutions. Our insulation services are available in Middleton, Janesville, Sun Prairie, Mc Farland, Verona, Waunakee, Stoughton, Mount Horeb, DeForest, Edgerton, Windsor, Cottage Grove, Marshall, Sauk City, Waterloo, Cross Plains and the nearby areas. Call 1-844-651-0955 or contact us online for an insulation estimate or home energy audit in Wisconsin.